Osteoarthritis, commonly shortened to OA, is a hot topic at the moment and has been given (well earned) media attention in the last few months alongside other chronic diseases. In 2015, OA impacted 2.2 million Australians (approximately 1 in 10). There is a push to inform Australians about the best treatment options for a variety of chronic conditions. I love this media attention because it is pushing a message I strongly believe in – EXERCISE IS TREATMENT GOLD. All of our clinical guidelines (and our evidence) keeps telling us how important exercise is, but knowing something and doing it are two different things! Today’s blog is all about reinforcing this message, educating our region about why exercise is they key and how you can start exercising in a motivated and safe environment! OA is a whole joint disease that impacts various components of the joint, in particular the cartilage. OA can occur in any joint that has cartilage. Our cartilage, no matter how old (or young) we are, goes through a constant regeneration and degeneration process. OA occurs when degeneration has started to outweigh regeneration. How do we help the regeneration process then I hear you ask? By appropriately loading the joint (ie EXERCISE)! That’s right, even in the most severe cases of OA, it is both safe and highly recommended to exercise to keep the cartilage healthy! 2. What are the benefits of exercise? Studies have found that all forms of exercise can help OA and other chronic conditions. There is mixed results around what is best but generally a mixture of aerobic (eg. walking, swimming or cycling), strength (eg. squats, lunges, resistance band or lifting weights) and neuromuscular (eg. balance, training muscles to “work together” well) exercises are recommended. 3. Is pain during exercise okay? Yes! Most people will experience some discomfort and/or pain when they first start doing an exercise. A slight increase in pain is safe, normal and expected. It should not continue to increase after exercise, or last more than 24 hours. If it does, it does not mean you need to stop exercising! It just means next time, cut back a little on how hard you exercise. 4. What other treatments might be used for OA? 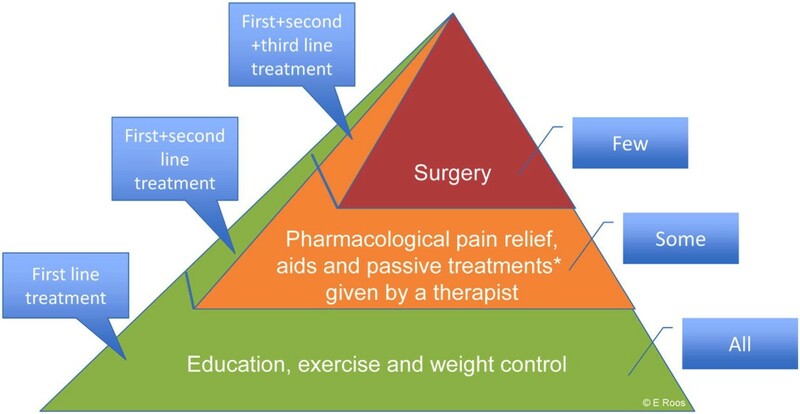 All the evidence tells us that exercise therapy, weight loss management and education about OA are the three best things you can and should do to help your symptoms. These items should be your number one priority initially. If you have tried all of these but are not getting enough relief, then surgery may be an option. Surgery should NOT be the only thing offered to you though. It is always worth exploring less invasive and other recommended options first. 5. Is there any evidence based exercise programs I can participate in Albury? Well, funny you should ask. I recently returned from a GLA:D Australia training course and am now a qualified GLA:D physiotherapist. Currently a rare species in the Albury region. I am very excited to be able to offer you a high quality (and fun!) program to help reduce your hip and/or knee OA symptoms. GLA:D (Good Living with Osteoarthritis: Denmark) is a six week exercise and education program developed by Danish researchers to help individuals with hip and/or knee OA. It involves 2 x weekly structured exercise sessions and 2 x education sessions across the six week period. In Denmark, research showed that participating in a GLA:D program reduced pain levels, reduced medication use and reduced sick leave. Participants had increased levels of physical activity and increased satisfaction 12 months post participation. This program is now international. In China, even orthopaedic surgeons are trained in running GLA:D ! I am incredibly excited to offer this to Albury and surrounds, so please get in touch today on 6021 2777 to register your interest with us. If you would like to know more information about the program, I am always happy and enthusiastic to tell people more, so ring our front desk and ask to speak to me directly. Otherwise, get out there and get moving to help that cartilage in your joints!